What We Eat Is Laughable: The Return of the Revenge of Ridiculous Eats, Part 2: Eating Eggstravaganza! The Return of the Revenge of Ridiculous Eats, Part 2: Eating Eggstravaganza! 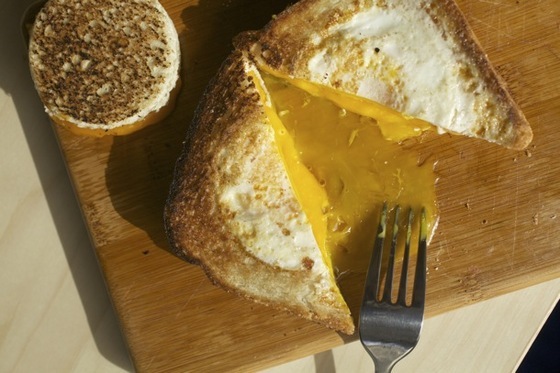 Not long ago a fellow food fiend posted this how-to slide show for Grilled-Cheese-Eggie-in-a-Basket. Take a moment to follow the link and click through. It’s cool, I’ll wait. Back? Drooling? Me too. Her posting of this was totez ironic, and by “ironic” I mean completely coincidental, as I had just recently posted my suggestion to dip, not toast, but grilled cheese into a sunny-side-up or over-easy egg yolk. My one had just been upped. Back to matters at hand. With all the fixins and hardware in place it dawned on me that cooking two whole slices of bread and their centers separately in my modestly sized frying pan wasn’t happening. So I improvised. If you have been graced with an outsized frying pan, by all means follow the Serious Eats method, if not I think I finally got the medium-pan-method down after five tries. - Assemble sandwich in traditional grilled cheese fashion, but don’t butter yet. - Using a pastry ring, cup, or some sweet, sweet eyeballin abilities excise the center of the sandwich. - Butter top and bottom of both parts of the sandwich. - Place all parts in pan and allow side one to fry at medium for about a minute-and-a-half to two. - Increase heat to high and flip sandwich parts. - After a minute crack two eggs into the hollowed out center of the grilled cheese. - Continue to cook on this side until the bottom of the egg has completely cooked and is solid enough to flip without running or leaking. - Flip sandwich and center again, still on high and cook for thirty seconds to a minute to ensure both sides are sealed. - Check the center cut-out for doneness and remove from heat if necessary, then reduce heat back to medium and cook the outside for two to three minutes. This method has worked great for me once, really well for me twice, just “OK” once, and too runny once when I was rushing, hence the extra minute or two at the end which is dependant more on your runny-whites preference level. I like them pretty firm, but even the longest cook time I gave this never solidified the yolks, which is key. Without a pastry ring or round cookie cutter I found that eyeballing it and cutting out a square center was easier and more effective than trying to cut around the mouth of a small drinking glass, and buttering after cutting ensures that the butter and bread don’t stick to the cutting board/plate/counter.